The PSAZF60 series of AC/DC power supplies offers 60 Watts of output power in an encapsulated design. This series has single output models with a universal input range of 85 ~265VAC. Other features include continuous short circuit protection, over voltage protection, and output current limitation. EMS meets EN61000-4 (-2,-3,-4,-5,-6,-8,-11) and EMI meets EN55022 level B conducted noise. The compliance to these EMI specifications minimizes system design time, cost, and eliminates the need for external filter components. The PSAZF-60 series has IEC / EN / UL 60950-1 safety approvals which qualifies this product for worldwide markets. This series has a wide variety of applications including both commercial and industrial with a MTBF of 125,000 hours. Notes: 1. To order the chassis mount version please add the suffix “C” to the model number (Ex: PSAZF-60S12C). 2. To order the DIN rail version please add the suffix “DN” to the model number (Ex: PSAZF-60S12DN). conditions will not damage these devices; however they may not meet all listed specifications. 4. 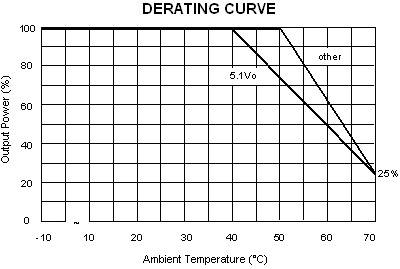 Input Current is measured at 115VAC, 60Hz. 5. Other input and output voltages may be available, please contact factory. 6. Long term short circuit operation may damage the unit.